The billion-dollar market – sporting goods industry includes stores, retailers, wholesalers, and manufacturers (to name a few) involved in the business of buying or selling various sports products. These products can be athletic apparels, sports footwear, outdoor sports equipment, and other related goods. Blue Mail Media’s Sporting Goods Mailing List can be your biggest asset if you are planning to create a marketing campaign to target the sporting goods industry professionals. 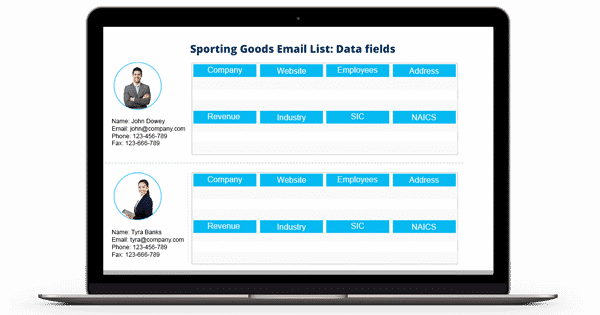 The list carries verified and updated contact details such as Name, Email address, Official address, Phone numbers, and more of the decision-makers and business professionals working in the sporting goods industry. To empower your marketing efforts the way they can bring you desired results, you need to possess a marketing database that is accurate, verified, and updated by using the most credible sources. However, finding data that is reliable is easier said than done. To cut the data chaos of the marketers, Blue Mail Media has come up with the solution. Our Sporting Goods Industry Email List is a verified contact database, and we update it on a regular basis, typically within every 60 days. We gather the details in this database by using sources that are authentic, such as trade shows, company newsletters, industry-specific conferences, and more. We infuse all our expertise and experience of years to make sure that you achieve better conversions and higher ROI with our marketing database of sports goods industry. Blue Mail has been a known name in providing qualitative data to numerous organizations around the world. Our team of adept data scientists, experts and analysts put a lot of hardships into collecting highly accurate data, verifying data for correctness, and enhancing the same on a regular basis. Also, we have a strong presence in North America, Europe, ASIA, Australia, New Zealand, Africa, Middle East and South America, which enables us to serve clients in a global yet local way.